ScenarioTools is an Eclipse/EMF-based tool for modeling, simulating, and synthesizing controllers from scenario-based specifications of reactive systems. Especially, the goal is to support the modeling of distributed reactive systems with a dynamic system structure, such as systems of communicating cars or flexible production systems. Visit scenariotools.org for more information. See the MODELS 2016 tooldemo video. 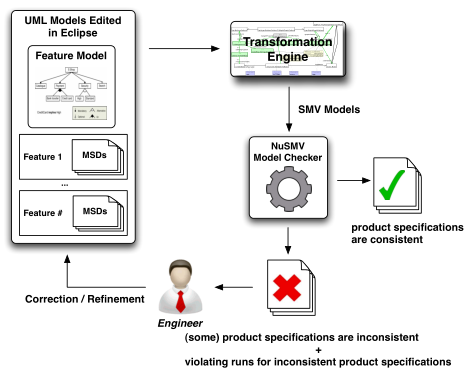 The TGG Interpreter tool suite provides tools for the specification and execution of Triple Graph Grammar-based model-to-model (M2M) transformations and model synchronization within the Eclipse platform for models conforming to the Eclipse Modeling Framework (EMF). More. This is a prototype tool for modeling and consistency-checking scenario-based specifications of product lines (many variants) of reactive systems. It is based on the modeling of product lines of reactive systems by a combinations of scenarios and feature diagrams. The specifications can be checked for inconsistencies using a variability-aware extension of NuSMV.